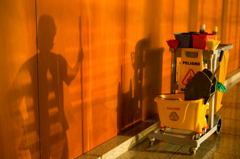 With over 25 years of experience in the industry, we have become one of London’s leading commercial cleaning companies. Our dedication to providing customers with bespoke cleaning solutions, whether schools or offices, builders' cleans or hotels, commercial carpet or window cleaning, means that we are able to offer an unrivalled combination of flexibility and award-winning quality. Chevron's expert cleaners hold accreditation from all relevant sources, including the British Institute of Cleaning Science (BICSc), and we hold public liability insurance of up to £10 million, ensuring that you are covered in the unlikely event of an accident or damage to equipment. Contact the friendly team at Chevron Cleaning today for more information about any of our services, or to request a quote for your requirements.